A few months ago, my boyfriend and I went to The Forks in Winnipeg to wander around & grab a delicious pastry from Tall Grass Prairie Bakery. Normally, I like to get one of their rhubarb strawberry muffins or even one of their amazing cinnamon buns. However, on this particular day, I was intrigued by their frangipane croissants. I had just got back from France and I think I was feeling a bit nostalgic. *hah* The frangipane croissant was incredible. Wow! The croissant was so buttery and soft. And the frangipane was just the right amount of sweet. 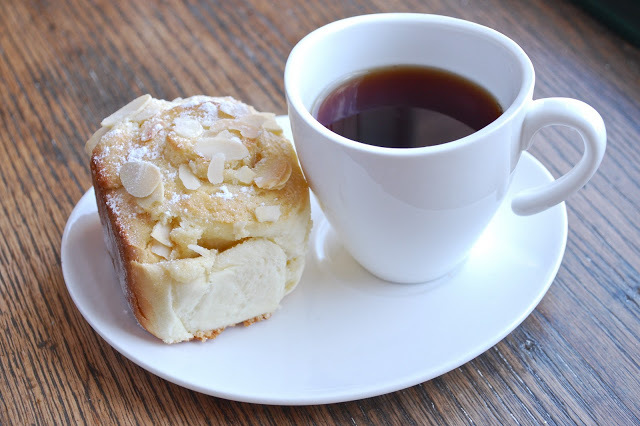 Ever since that day, I have wanted to try re-creating the almond paste croissants at home. However, since I still have not conjured up enough courage to try making croissants from scratch, I’ve gone without the delicious pastry for months. And I’ve not seen them again at the bakery since! Perhaps they are a best seller? Anyway, this week I stumbled upon a frangipane bun very reminiscent of a cinnamon bun. You basically start with a sweet yeasted dough as you would a cinnamon bun. However, instead of coating the dough with a cinnamon/brown sugar/butter mixture before rolling it, with the frangipane buns you coat the dough with a mixture of ground blanched almonds, white sugar, butter and pure almond extract. Amazing. Although the buns were not as flaky as the croissants at Tall Grass Prairie, I think my craving is finally satisfied. 1. In a small saucepan, heat together the milk, all but 2 teaspoons of sugar, the butter and salt until the butter is melted; let cool to lukewarm. 2. In the bowl of an electric mixer, dissolve the remaining sugar in the warm water. Sprinkle in the yeast. Let the mixture stand until frothy (about 10 minutes). 4. Put the dough hook attachment on your mixer. Mix on low speed for 8 minutes. Be sure to add flour if dough is too wet. Dough should be smooth and elastic after 8 minutes of mixing. 5. Place dough in a lightly greased bowl. Turn to grease the entire ball of dough. Cover with plastic wrap and let rise in a warm place until doubled in bulk (approximately 1 and 1/2 hours). 6. After the dough has doubled in size, punch down the dough. Roll the dough out into an 18 X 14 inch rectangle. 2. Leaving a 1-inch border, spread the frangipane evenly over the dough; mounding the frangipane slightly along one long side. Starting from the mounded side, tightly roll the dough to make a log formation. Pinch the seam to seal. 3. With a serrated knife, cut the roll into 12 slices. Arrange the slices, cut side up, in a prepared baking pan. Cover the pan with a clean tea towel; let the buns rise in a warm place until doubled in bulk (approximately 45 minutes). 4. Once the buns have doubled in bulk, brush beaten egg over the tops of the buns. Sprinkle the tops with sliced (or slivered) almonds. 5. Bake the buns in the centre of the oven at 375’F until golden (20 to 25 minutes depending on your oven). (note: rolls will sound hollow when tapped on the bottoms when they are perfectly done baking) Let the pan cool for 5 minutes and then transfer the frangipane buns to a wire rack and let cool. Dust with icing sugar.